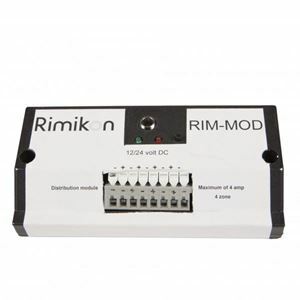 Rimikon’s power distribution module is an easy way to distribute your LED light loads to maintain your total output at 4 amps. Plug in the 2.5mm, 24V jack from your power supply into the module and from there you can run up to 4 locations without going over the 100 amp load. Installation: Example: One 24V power supply can light up to eight 7.5W LED recessed lights. The power distribution module would then allow you to run two LED lights in four different locations or rooms. You could also run them off of four different switches.